Gesher Galicia has indexed the 1910 Jewish Census of Tarnopol, the last official census conducted in Galicia by the Austrian government, which is held in the State Archive of Ternopil Oblast (DATO), as Fond 33, Series 1, Volume 113. With almost 14,000 names, it lists every Jewish person resident in Tarnopol in 1910, along with information on people who had moved away permanently, or were studying in other places. Entire households are listed, along with their house numbers, professions, and ages, and relationships within the household. To view the list of surnames found in this enumeration, click here. To view the list of street names click here. To learn how to search the Tarnopol 1910 Jewish Census, click here for the Tarnopol Census Infosheet. In the census, women are sometimes listed as “ritual wife,” implying that there was a religious marriage, but that the woman did not share her husband’s surname. In these pages it is common to find people born elsewhere who had moved to Tarnopol, and, conversely, people who had already left the city for other countries. The census therefore also provides clues as to the migration of your relatives. It lists many people who were “absent” in “America” or “New York, America.” Other destinations where residents moved (in a mixture of cities and countries) are: Cologne, Frankfurt, Russia, Germany, Vienna, Lwów, Prague, London, England, Switzerland, Argentina and Jerusalem. 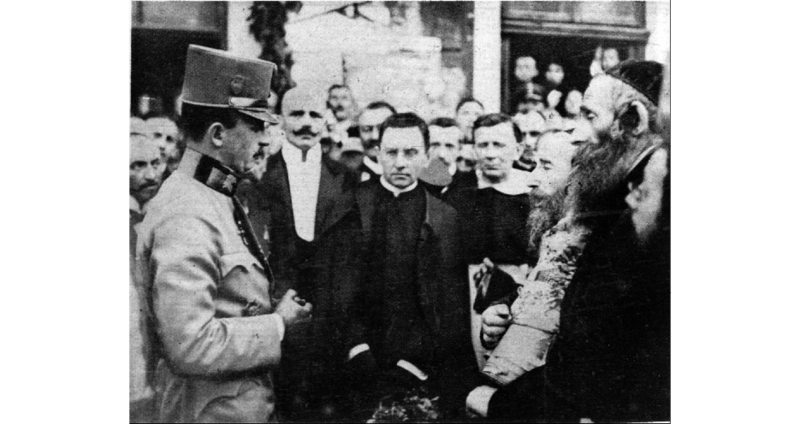 Original places of birth include towns and villages all over Galicia, as well as Vienna, New York, Kiev and Warsaw and towns in Germany, Romania and Hungary. House numbers are provided, alsong with a street address. The detailed extracted data from the 1910 Jewish census is freely searchable on the All Galicia Database. 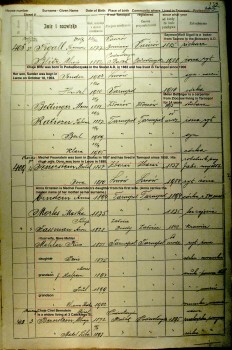 for images of the index book of the 1890 census, click here. for images of the index book of the 1880 census, click here. Many pages of the index book of the 1880 Jewish census have become damaged, with the result that some entries cannot be properly deciphered. 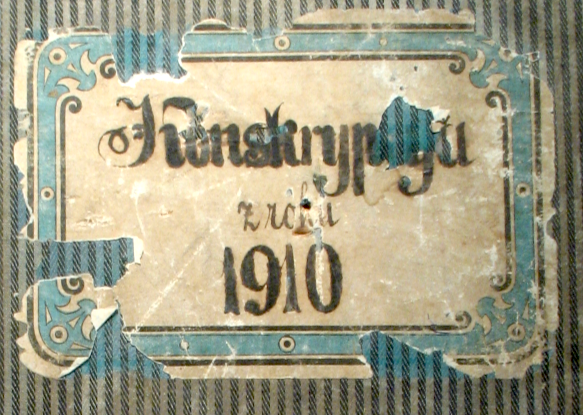 The full record book of the 1890 census is held in the Central State Archives of Ukraine in Lviv (TsDIAL), in their Fond 701, Series 1, Volume 356. However, only about 63% of the original census book is there (listing 6,800 people), the rest of the book having been lost. Gesher Galicia has indexed and put onto the All Galicia Database a set of Jewish residents’ cards from Tarnopol from the 1930s. 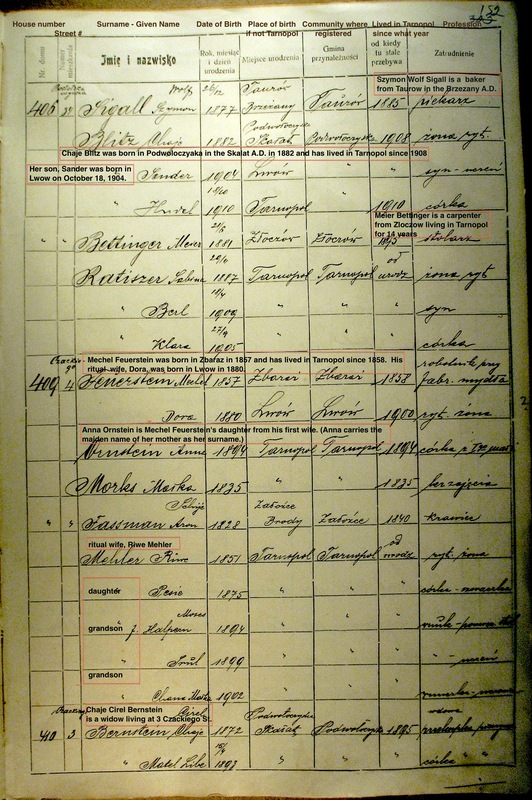 This was not, strictly speaking, a census conducted at a single point in time, but a register of Jewish households that was updated over a number of years. Only part of it has survived – namely, for surnames of the heads of household starting with the letters G–N, S, T and V. [Other surnames starting with other letters, of course, also occur in these records, such as maiden names.] 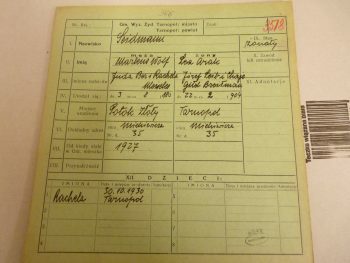 These records are held at AGAD in Warsaw in their Fond 424, Files 157-164.